All loans will be in the name of the Trustee, or Marketlend, the seller to the Trust. 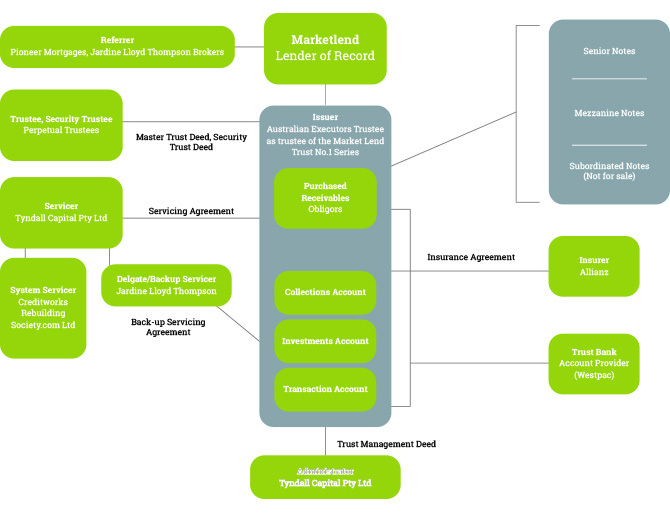 The Trustee or Seller will ensure that Marketlend or the Trust has legal ownership of the loans and all payments will be paid by direct debit directly into the Marketlend or Trust account to protect all the cash flows commonly referred to as a Locked Box solution, effectively other than for the special purpose or the Trustee or at the Trustee’s direction no monies can be removed from the trust account. In the case of Marketlend it is established as a special purpose company and it is not used for any purpose other than the special purpose of receiving investment, origination, servicing and receiving payments. The structure is a well established and legally robust structure. It is established in Australia and proven to support many funding solutions including the major banks. Here is the current key legal documents set out by the various roles for the marketplace lending platform.